I am not entirely sure when I decided that I would try to run the London Marathon again. I think it may have been August last year. What matters is that for the last six months or so, I have been spending less time in the gym and more time on the road, trying to get miles under my feet so that I’m ready for April. Last time I competed I fell over at 19 miles and couldn’t get up again. This time I hope I’ll be luckier. 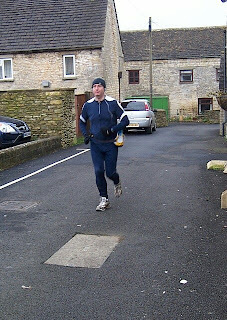 This picture shows me setting out on a 10k run on a cold and very wet morning last Sunday.